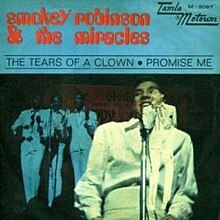 "Who's Gonna Take the Blame"
(1970) "The Tears of a Clown"
(1970) "I Don't Blame You at All"
"The Tears of a Clown" is a song by Smokey Robinson & the Miracles for the Tamla Records label subsidiary of Motown, originally released on the 1967 album "Make It Happen". It was re-released in the United Kingdom as a single in September 1970, where it became a #1 hit on the UK Singles Chart. Subsequently, Motown released "The Tears of a Clown" as a single in the United States as well, where it quickly became a #1 hit on both the Billboard Hot 100 and R&B singles charts. The song is an international multi-million seller and a 2002 Grammy Hall of Fame inductee. Its success caused Miracles lead singer, songwriter, and producer Smokey Robinson, who had announced plans to leave the act, to stay until 1972. Stevie Wonder (who was discovered by Miracles member Ronnie White) and his producer Hank Cosby wrote the music for the song, and Cosby produced the instrumental track recording. Wonder brought the instrumental track to the 1966 Motown Christmas party because he could not come up with a lyric to fit the instrumental. Wonder wanted to see what Robinson could come up with for the track. Robinson, who remarked that the song's distinctive calliope motif "sounded like a circus," provided lyrics that reflected his vision and sang lead vocal. In the song, his character, sad because he does not have a woman who loves him, compares himself to the characters in the opera Pagliacci, comedians/clowns who hide their hurt and anger behind empty smiles. He had used this comparison before: the line "just like Pagliacci did/I'll try to keep my sadness hid" appears in the song "My Smile Is Just A Frown (Turned Upside Down)," which he had written in 1964 for Motown artist Carolyn Crawford. The record is one of the few hit pop singles to feature the bassoon, which was played by Charles R. Sirard. "The Tears of a Clown" was an album track on 1967's "Make It Happen" but was not released as a single. By 1969, Robinson had tired of constantly touring with the Miracles, and wanted to remain home in Detroit, Michigan, with his wife Claudette and their two children, Berry and Tamla (both named after aspects of the Motown corporation). Robinson informed his bandmates Pete Moore, Bobby Rogers, and best friend Ronald White that he would be retiring from the act to concentrate on his duties as vice-president of Motown Records. In 1970, to capitalize on the Miracles' success there, and due to a lack of new material from the group, Motown Britain selected "The Tears of a Clown" from the group's catalog for single release. A new mix of the song was made in February 1970 for the single release, and "The Tears of a Clown" became a #1 hit in the UK after its September release. The 45 single was issued with two different B-sides: the first pressing had an alternate version of the 1967 Miracles Top 20 hit single "The Love I Saw In You Was Just A Mirage;" the second had a new Miracles song, "Promise Me." Motown released a "Tears of a Clown" LP in 1970 as well, which was essentially a re-packaging of the Miracles' 1967 "Make It Happen". It was included again on the group's 1971 LP "One Dozen Roses". Two years later, Smokey Robinson decided to follow through with his plans to leave the Miracles and retire. Smokey Robinson & the Miracles embarked on a six-month farewell tour, culminating in a July 16, 1972 performance in Washington, D.C., where Robinson introduced the Miracles' new lead singer, Billy Griffin. The song charted again in the UK in 1976, peaking at #34. There is some uncertainty about who from the Motown session musicians The Funk Brothers played bass on the recording of "The Tears of a Clown". Variously Tony Newton, Bob Babbitt and James Jamerson have been noted as playing on takes of the song. The record centre displays visible no signs of spindle wear.